The German education system is different in many ways from the ones in other countries, but it produces high-performing students. The overwhelming majority of German students attend public schools. The whole German education system, including the universities, is available to the children of bona fide expatriates. The catch, of course, is that the classes are conducted in German, which is usually all right for school beginners but becomes more and more of a problem as the children get older. But, there are also many private schools. Although education is a function of the federal states, and there are differences from state to state, some generalizations are possible. Children aged three to six, may attend kindergarten. After that, school is compulsory for nine or ten years. 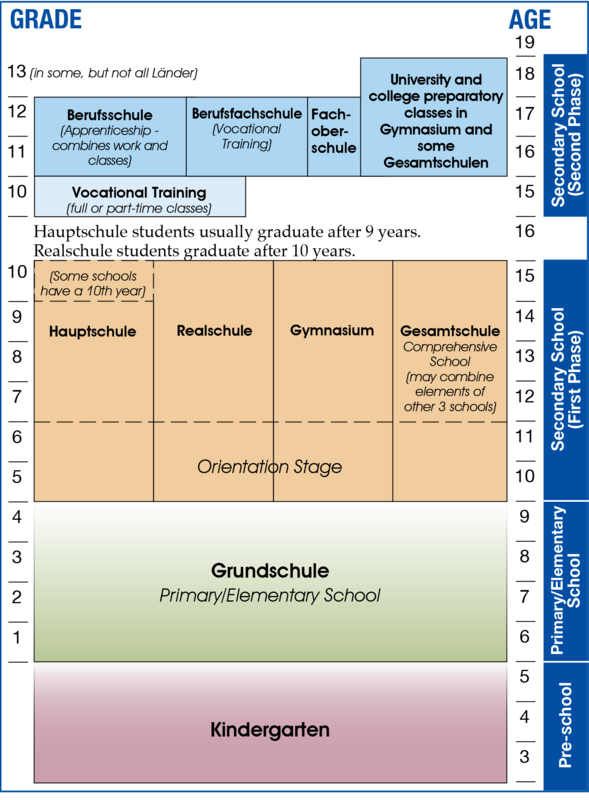 From grades 1 through 4 children attend elementary school (Grundschule), where the subjects taught are the same for all. Then, after the 4th grade, they are separated according to their academic ability and the wishes of their families, and attend one of three different kinds of schools: Hauptschule, Realschule or Gymnasium. Grundschule teachers recommend their students to a particular school based on such things as academic achievement, self-confidence and ability to work independently. However, in most states, parents have the final say as to which school their child attends following the fourth grade. Get advice from local expats in Germany and find out what they have to say about schools in your city. The Hauptschule (grades 5-9) teaches the same subjects as the Realschule and Gymnasium, but at a slower pace and with some vocational-oriented courses. It leads to part-time enrollment in a vocational school combined with apprenticeship training until the age of 18. The Gymnasium leads to a diploma called the Abitur and prepares students for university study or for a dual academic and vocational credential. Curricula differ from school to school, but generally include German, mathematics, computer science, physics, chemistry, biology, geography, art (as well as crafts and design), music, history, philosophy, civics, social studies, and several foreign languages. In recent years many States have changed the curriculum so students can get the "Abi" at the end of the 12th grade. Other States are making the transition but may still require a 13th grade. The Gesamtschule, or comprehensive school, is only found in some of the states. It takes the place of both the Hauptschule and Realschule. It enrolls students of all ability levels in the 5th through the 10th grades. Students who satisfactorily complete the Gesamtschule through the 9th grade receive the Hauptschule certificate, while those who satisfactorily complete schooling through the 10th grade receive the Realschule certificate. Beyond the Hauptschule and Realschule lies the Berufsschule, combining part-time academic study and apprenticeship. The successful completion of an apprenticeship program leads to certification in a particular trade or field of work. These schools differ from the other ones mentioned in that control rests not with the local and regional school authorities, but with the federal government, industry and the trade unions. No matter what kind of school a student attends, he/she must complete at least nine years of education. A student dropping out of a Gymnasium, for example, must enroll in a Realschule or Hauptschule until nine years have been completed. Students are required to study at minimum one foreign language for at least five years. A second foreign language is required in Gymnasium. German students at public schools normally attend school in the morning. Classes normally start between 7:30 and 8:15 a.m. and can end between 12 noon and 1:30 p.m. Class periods are normally 45 minutes long with a short break in between. However, in recent years some schools (Ganztagsschule) have started offering longer days. The additional hours can be used for doing homework or participating in various extracurricular activities. With the extra hours there is a hot lunch and this has necessitated adding a cafeteria in these schools. There can be a lot of homework and heavy emphasis on the "three Rs" - reading, writing and aRithmatic. The curriculum expands as students move up from Grundschule and depends on which of the three secondary schools they attend. The school year consists of two semesters and normally starts around the middle to end of August. There are longer breaks at Christmas and in the summer. Shorter breaks are around Easter and in autumn. There is no school on public holidays. The Christmas break is usually 2 weeks and the summer break is about 6 weeks. The exact dates of the various vacations and breaks are set by the individual Länder. There are different schools for students with special needs called Sonderschule or Förderschule. Depending on the individual's needs and a school's availability, a student can attend one of the special schools. These schools are staffed with specially trained teachers and generally have a smaller student to teacher ratio than the regular schools. Some special needs students don't attend these schools and are integrated into a Hauptschule or Gesamtschule. There are a number of different types of private schools in Germany. These schools usually charge tuition and may offer varied courses leading to the German Abitur as well as other diplomas and certificates at the conclusion of studies. The Internat are German boarding schools. There are several hundred of them in Germany offering a variety of study programs. 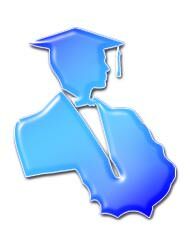 Most offer the Abitur and may offer additional specialized courses in different subjects or pursuits. There are sports Internat, music Internat as well as Internat that specialize in other areas. There are also some separate boarding schools for boys and girls. 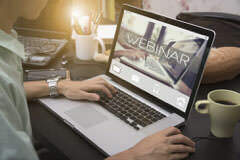 The several dozen International Schools in Germany normally offer courses in English leading to an IBO or other diploma or certificate that allows the students to continue on to college or university. There are many Protestant and Catholic private schools that offer the standard German Abitur. Home schooling is illegal in Germany. The law requiring students to attend public schools or approved private schools has been upheld despite challenges to it. There are several varieties of university-level schools. The classical universities, in the tradition of Alexander von Humboldt, provide a broad general education and students usually attend them for up to six years. However, in recent years there have been changes to the curriculum allowing a university student to acquire a Bachelor Degree after 4 years. The Technical Universities (Technische Hochschulen) are more aimed at training students for specific careers and are usually attended for four years. There are also Hochschulen for art and music.